The next stop on our Aosta Valley tour was Pila, a little-known resort reached either by road up a vast number of switchbacks, or by a gondola which starts in the stunning former Roman city of Aosta, the main town of this region. Pila is popular with schools and families as it has a good selection of varied terrain ideal for beginners and intermediates with a few challenging expert runs. It’s extensive snow-making means there is always a good selection of snow sure slopes. The treeline is high (2300m), which means there are many well protected slopes in bad weather. The few black runs are nearly all above the treeline and the skiing goes up to 2700m. The start of the 20-minute gondola ride is quite unusual, as your first views are of car showrooms, a bowling alley and the main motorway. But then, as you gain attitude, you are in the mountains and transported to the all-purpose resort centre of Pila. Editor Watts and I had been here before, when the annual SIGB (Snowsports Industries of Great Britain) ski test was held here. Since then there have been a number of new lifts, new terrain added and a new black run at the top of Coulis 1 chairlift that we wanted to try. But unfortunately the ski patrol were blasting this area so we didn’t get to see the magnificent views at the top that stretch to Cogne and the Gran Paradiso with Mont Blanc to the west and the Matterhorn to the east. Our guide and instructor Andrea set off up the Chamolé lift showing us the beginner areas, and wide blue runs. The resort is mostly red runs with some long blues and the conditions were excellent. We worked our way across the ski area tackling the higher and steeper slopes at Coulis 2 when there was a break in the clouds. It was mid-week and blissfully uncrowded except for one brief moment when we came across a number of “bambinos” following their instructor zigzagging unpredictably across the slope. 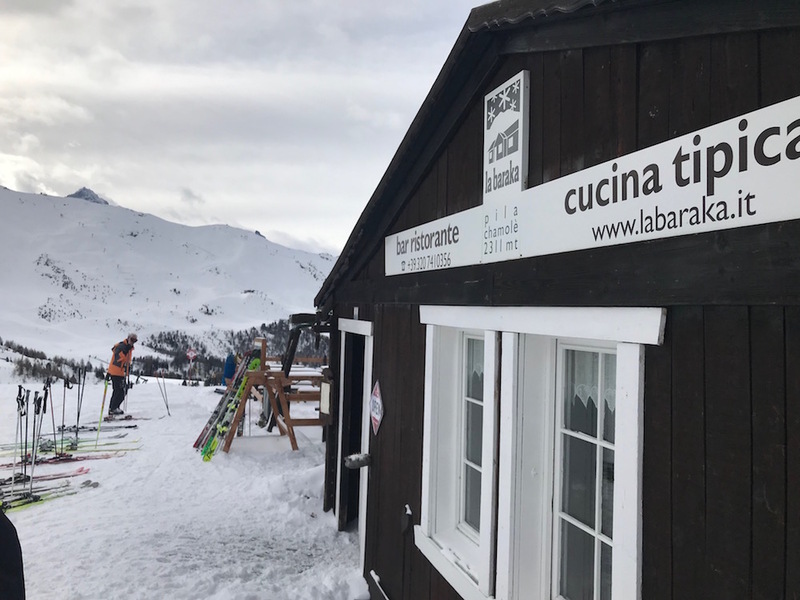 After a chilly January morning of non-stop skiing, the cosy atmosphere of La Baraka at the top of the Chamolé lift, with its rustic style, wood burning stoves and large cakes was a welcome break. In the afternoon we skied nearly all the remaining runs that were open, still finding some fresh snow on the pistes and a few pockets of powder in the trees. Sadly we didn’t have time to explore the beautiful pedestrianised centre of Aosta and its Roman amphitheatre, as it was time to head to our next stop, Cervinia.